Art Acevedo is police chief in Houston, Texas. His message to people in his beleaguered city: “Just hunker down, hold tight—we hear you, we feel you. Believe me.” His police officers have rescued more than three thousand people as of this morning. 911 operators fielded fifty-six thousand calls within twenty-four hours when the crisis began. Numerous companies have pledged millions of dollars to relief efforts. Red Cross personnel are preparing for weeks of assistance to those affected by Hurricane Harvey. President Trump and the first lady will visit the Texas Gulf Coast later today. While police officers, 911 operators, and disaster relief workers have been saving lives in Houston for days, some may wonder where God has been as this disaster unfolded. What would our Lord say to those devastated by this unprecedented crisis? • He knows your name. He called Zacchaeus and Saul of Tarsus by name, even though they were two of the most infamous sinners in the Bible. • He knew you before you were born: “Your eyes saw my unformed substance; in your book were written, every one of them, the days that were formed for me, when as yet there was none of them” (Psalm 139:16). • He knows your actions and thoughts: “You know when I sit down and when I rise up; you discern my thoughts from afar” (Psalm 139:2). • He knows every detail of your life: “Even the hairs of your head are all numbered” (Matthew 10:30). • He knows your pain: “I have surely seen the affliction of my people . . . and have heard their cry” (Exodus 3:7). • He suffers as you suffer: “In all their affliction he was afflicted” (Isaiah 63:9). • He will never forget you: “I will not forget you. Behold, I have engraved you on the palms of my hands” (Isaiah 49:15–16). • He walks with you through calamity: “Even though I walk through the valley of the shadow of death, I will fear no evil, for you are with me; your rod and your staff, they comfort me” (Psalm 23:4). The psalmist declared, “God is our refuge and strength, a very present help in trouble” (Psalm 46:1). As a result, he testified, “we will not fear though the earth gives way, though the mountains be moved into the heart of the sea, though its waters roar and foam, though the mountains tremble at its swelling” (vv. 2–3). Every rescuer is an extension of God’s compassion and care in these catastrophic days. If the Lord could describe a pagan king like Cyrus as “my anointed” (Isaiah 45:1) and call Nebuchadnezzar “my servant” (Jeremiah 43:10), he can use every person who will be used. Every act of assistance, every resource and provision is his gift of grace and mercy. I believe that the One who wept over Jerusalem (Luke 19:41) weeps over Houston and the Texas Gulf Coast today. Now our Father calls us to share his heart for his children. If those devastated by this crisis were your brothers and sisters, how would you feel about them? Hurricane Harvey – Any donations we receive with the words “Harvey” or “Hurricane” will go straight to help with the relief effort. We will be hosting and providing a shelter near the heart of Houston (Bethel Baptist Church on Tidwell), as well providing much needed supplies and support to other churches that join us in this effort. Please select the Donate to USM Button today to give and continue to Pray for our city as we seek to serve and to share the love of Jesus through action. Thank you for all your support and may God bless you! The summer of 2017 has been one for the Kingdom in the life of City Church Del Rio. With just a few more weeks left before the fall semester kicks in, I would like to recap some of the highlights of the amazing time we had. We kicked of the summer with MegaSports Camp/VBS. Churches from Lifehouse Fellowship of Canton, TX and Cibolo Valley Baptist Church of Schertz, TX were here to help out with the average of 90 kids each day. Also in June, First Baptist Church of Albany came to Del Rio to help with indoor work. Next on the list was First Baptist Church of Copperas Cove, TX. They came and did a whole list of work including helping our work at the fireworks stand, working at our local food pantry fishes and loaves, a 2-day sports camp, and ended with a huge block party on the creek. 24 Bookcases built and painted! Then came First Baptist Church of New Braunfels, TX. This group began the week by learning how to Share Jesus without Fear as an evangelist method to witness to those who need to hear the good news. As soon as FBC New Braunfels left, Lakeshore Drive Baptist Church came into town to help build a much needed storage shed, work at fishes and loaves as well as help us with our literacy ministry. First Baptist Llano also came to partner with us as they went to Quemado, TX to continue work on a new ESL school at the Children’s Cornerstone Ranch. City Church Del Rio’s also took a mission trip to Houston, TX! I am posting this article since it is just a few days after the eclipse. Enjoy! You will know when the end comes. 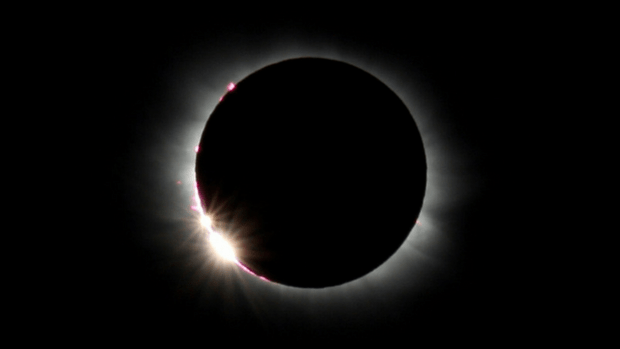 Well, you can tell from the title of my article that I think seeing the eclipse as a sign is silly and unhelpful to the reputation of Christians. So, Greg Laurie, why in the world are you talking about the prophetic significance of the solar eclipse? So, get past the clickbait headline from whatever Hello Christian is, and Greg is right—so let’s heed his counsel. Contrary to the hyped-up news stories you might have seen concerning how Christians are reacting to the eclipse, there is no concern amongst any Christian leaders I know that the eclipse is a sign of an immediate Armageddon. And it certainly isn’t anything for us to fear. The media often attempts to find fringe people that claim to be Christian, but often have little more platform than a badly-arranged blog and a few Twitter followers to ‘represent Christianity’ to the masses, via an often-hyperbolized segment designed to make Christians look stupid. We’ve seen this before: the blood moons, planets aligning, 2012, and other events that are adopted as signs to serve a political point or send a message of God’s impending judgement. Often the message isn’t directly contradictory to Scripture (judgement is real), but the method of communicating and proving it (i.e., God’s judgement is on America because of X event) becomes harmful, embarrassing Christians every time it is proved to be untrue. 1. For those few spreading fear about an eclipse, you’re embarrassing Christians, not representing Christ. What I would say to those few fringe Christians who are saying such things is that you do nothing but harm the reputation of Jesus in the world around you. The media pounces and hyperbolizes your fringe perspective into being normative, and it causes reproach upon Jesus and His Church. Your complex machinations about how the eclipse or current events are a proof the world will end in that moment distracts people from the simple truth that they are sinners and apart from Christ they are lost and without hope. To Christians who draw these conclusions: Stop, you’re making yourself and us look foolish the day after the eclipse. It gives the world more opportunity to roll their eyes and assume your foolishness is our foolishness. But let’s be honest. There are not many people doing this, so let me go to the second issue. 2. To journalists who seek to highlight Christians who see the eclipse as a sign of the end: it’s not honest reporting. It’s disingenuous and dishonest. I don’t see any of these news sources going around looking for Hindus and Muslims looking for their strange ideas—but they do so for Christians. We have fringe people who ascribe cult-like significance to normal astrological events, but they do not represent mainstream and normative Christianity. No one in the mainstream sees a sign of the eclipse in America as certainty that the world is ending on Monday. 3. For anyone thinking an American-viewed eclipse is a sign of the end, how American centric can you be? In reality, there is an eclipse somewhere on the earth at least once every 18 months—the fact that it is happening in St. Louis does not make it an eschatological sign. When a Christian thinks that an eclipse in the U.S. is the sign of the end, they become both America-centric and biblically unsound. Calling an eclipse a sign is like calling a full moon a sign—the eclipse is just less common. It’s predictable, but it’s less common. Just because something is less common doesn’t automatically mean you can adopt it as a sign to serve a specific agenda or message. The deeper problem is that people read their own political agenda and experiences into the Scriptures, then incorrectly search for exterior proof of their hermeneutically unsound opinions, and finally proceed to scream the perception of truth and its proof from the rooftops. People do this instead of letting Christ’s agenda for His Kingdom read and speak into them. When you twist the Bible to match current events, you’re saying our own experiences right here and now are more important than Jesus’ simple Gospel of His already accomplished work on the cross, for your sins, and in your place. The truth is this: Christians have always believed that Jesus is going to return—and might return at any moment. (We call that the imminent return of Christ.) The Bible does give us clarity in Matthew 24 that celestial signs will happen. But when the cumulative event happens, it will be undeniable. Until then, Jesus tells us: “concerning that day or that hour, no one knows, not even the angels in heaven, nor the Son, but only the Father. Be on guard, keep awake. For you do not know when the time will come” (Mark 13:32-33). Our job is to be awake, to repent and believe the Gospel, to love our friends and neighbors, and tell others about Jesus. We don’t need an eclipse to do that. If you want a sign of God’s judgement, don’t look to the sky. We only have to look at ourselves and we can see it—when we can’t call out evil and when right is called wrong. That’s a bigger issue than an eclipse. On Monday, some people are going to make believing in Jesus look silly again, and some in the media is ready to help them do that. The eclipse IS a sign… a sign of the finely tuned universe that points to an active creator. And Jesus will then come… at a time of his choosing, unrelated to these things. Since all these things are to be dissolved in this way, it is clear what sort of people you should be in holy conduct and godliness as you wait for the day of God and hasten its coming. Because of that day, the heavens will be dissolved with fire and the elements will melt with heat. But, the point here is how we live, and what sort of people we should be in the meanwhile. You will know when the end comes—trust me. Until then, let’s make much of Jesus.